Qioptiq is known for high-quality plane plates from optical glass, fused silica and sapphire, as well as a variety of prisms, filters, beamsplitters, reticles and dispersion plates. We can offer support for all your applications that require precise planarity and flawless surfaces. High-quality materials ensure the best possible transmission and consistent, reliable quality standards in all Qioptiq products. In production, we place a high value on the narrowest possible angular tolerances and the best parallelism, integrity and fit. Qioptiq plano optics and their coatings are manufactured using the latest machines and are subject to constant, meticulous quality control. Qioptiq stands for lasting precision! 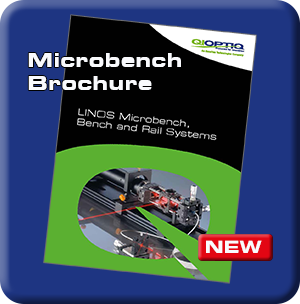 Many components are available in mounts compatible with LINOS bench systems. Prisms can also be found in the Prism Wizard of the WinLens 3D program. Beam deflection, Beam splitting, Measurement tasks, View panels, and more.